EUNIC is the European Union National Institutes for Culture and is a partnership between national cultural institutes from EU member states, which represent their country’s cultural and educational connections to other countries worldwide. 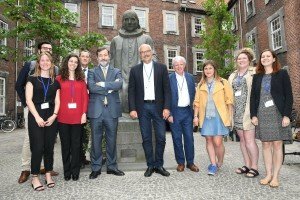 The EUNIC General Assembly was held in June of 2016 in Copenhagen. A partnership with the EU and a restructuring of the organization was discussed among other things. Find out more here. EUNIC was founded in December of 2006 in Copenhagen and currently has 35 members from 28 countries. EUNIC’s members are institutions who are present in more than 150 countries with over 2.000 offices. They work within the fields of art, language, education, youth, science, intercultural dialogue and development. Members meet all over the world in so-called clusters to develop local activities. There are more than 100 clusters around the world. A cooperative network – that works with partners like the European Commission, The Council of Europe, as well as other partners around the world. The project is intended to strengthen the network of European cultural institutes and the cooperation through EUNIC. Crossroads for Culture is partly financed by Creative Europe’s support programme for networks. Learn more about Crossroads for Culture here. The project is headed by the Goethe Institute in collaboration with Danish Cultural Institute. A project that combines culture and sustainability (initiated by Danish Cultural Institute). Learn more about Culture|Futures here. A celebration of contemporary European literature every year in May. Learn more about Literature Nights here. EUNIC is a main actor in language training and is behind the project Poliglotti4eu, which promotes multilingualism and diversity. Learn more about it on the website: www.poliglotti4.eu. The strategy for EUNIC’s work is set by EUNIC’s management, which is comprised of Secretary Generals from the respective countries’ cultural institutes and leaders of other member institutions. The management chooses a President and a Vice-President every year, who serve a one-year term. The Vice-President goes on to become President. From June 2016, the EUNIC board is comprised of 6 members. Currently Michael Metz Mørch, the Secretary General of Danish Cultural Institute, is the President of EUNIC and Koen Verlaeckt from the Flanders Department of Foreign Affairs is Vice-President. Other than the President and Vice-President, EUNIC’s Board of Directors is now comprised of Johannes Ebert from the German Goethe Institute, Anne Grillo from the French Ministry of Foreign Affairs, Teresa Indjein from the Austrian Ministry for Europe, Integration and Foreign Affairs and Zdeněk Lyčka from Czech Centres. Each of them have a designated co-worker in their organization, who is the liaison officer. EUNIC has a global office in Brussels, that arranges interdisciplinary projects. Eric Messerschmidt, Head of Danish Cultural Center in China, is currently President of the EUNIC cluster in China.